BOTB.com is the website of Best of the Best Plc, registered in the United Kingdom (company number 03755182, registered address 2, Plato Place, 72-74 St Dionis Road, London, SW6 4TU). Any reference in this policy to “BOTB”, “we”, “us” or “our” is to Best of the Best Plc. 5. How to contact us if you have any issues or want to find out more. In addition to the above, we may also anonymise and aggregate your personal data in a way which means you cannot be identified. This may be helpful to us for testing our internal systems, carrying out research and general customer data analysis. Because this is not personally identifiable, we can use this for any purposes. Importantly, we do not pass your personal data onto any third parties for them to market their products/services to you. If in the future we decide that we want to, we will only do so if we have your consent. In addition to the above, we may also be required to share your personal data with third parties if required by law or regulation. In such circumstances, we will make sure that the disclosure is only to the extent required by law or regulation. The European Economic Area or “EEA” is deemed to have good standards when it comes to data privacy. As such, we consciously limit the occasions when we may need to transfer or handle your data outside of the EEA. Where we do, for example where our service providers are based outside of the EEA, we make sure that your data is still treated fairly and lawfully in all respects (including making sure we have a legal ground for sending your data outside the EEA and putting in place all necessary safeguards for such arrangement). We adopt industry standard security processes to ensure your data is kept safe and secure and to prevent unauthorised access or use or loss of your data. By way of example, we use secure server software (EV SSL) which encrypts all information you input before it is sent to us. We also make sure that third parties who need to handle your data when helping us to deliver our services are subject to suitable confidentiality and security standards. We will keep your data for as long as you hold a BOTB account and/or where you are still happy to hear from us about our latest news, products and services. 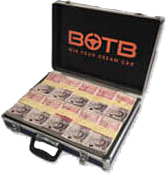 Once you no longer wish to be engaged with BOTB we may still need to keep hold of your data if there is a legal reason for doing so (such as for tax purposes where you have made purchases to play in our competitions or where we need to resolve any disputes with you). If you want to exercise any of these rights, please Contact Us. You don’t have to pay a fee to exercise your rights, unless your request is clearly unfounded, repetitive or excessive (in which case we can charge a reasonable fee). Alternatively, we may refuse to comply with your request in these circumstances. Where your request is legitimate, we will always respond within one month (unless there is a legal reason to take longer, such as where your request is particularly complex). We may also need you to confirm your identity before we proceed with your request if it is not clear to us who is making the request. In addition to the above, you may get in touch with the ICO (Information Commissioner’s Office) if you are concerned about the way in which we are handling your personal data. However, where possible, we would really appreciate you speaking with us first if you have any concerns. You can opt-out of any BOTB marketing at any time either by Contacting Us or by using the opt-out function detailed in the relevant marketing email. Please note that we may still need to send you service notifications by email, such as advising you of updated privacy terms or terms of play. We do not pass your data onto any third parties for their marketing purposes. However, if we ever wish to do so in the future we will always get your consent. You can then opt-out from any third party marketing at anytime following the same process as above.